When you are designing or upgrading your pizza place, you have to consider how your customers perceive you, and how you want to be perceived. You create your own image, and that means more than just making your pizza shop look presentable. When you begin to work on your pizza shop's image, you should take into consideration the following points. What is the mood that you are trying to set for people who come into your pizza place? Are you trying to create a fun, festive mood where everyone can get together and watch the big game? Are you developing a child friendly atmosphere for your shop? Are you looking to create a traditional pizza place instead? Once you come up with a good style, you will want to stick with that theme and style as long as it works for you. 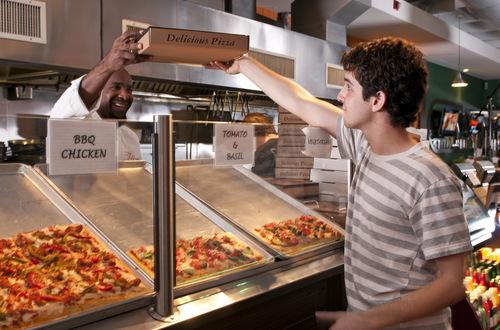 You need to be aware of the way that your pizza shop and your employees appear to customers who enter your shop. While a dingy pizza parlor might do fine in some neighborhoods, you never want anyone to call your place dingy or dirty. This means that you have to ensure that everything is clean, neat and tidy. With the speed at which information travels today, having dirty tables when you seat customers means that by the time you get back to the kitchen, a photo of that dirty table will probably appear online somewhere! You do not want this negative word of mouth. Having a great pizza menu is important as well. Great food is what will keep people coming back to your place and it is what will help cement your reputation in the public’s eye. While it is nice to have a menu that offers tons of different options, you never want to sacrifice quality for quantity. Make sure that all of the pizzas and other dishes that you make in your shop are as good as possible. When you make great food and you give your customers a great place to dine, offering take out and delivery options, you will find that they will help to spread good words about your shop. Whenever you are dealing with customers, you have to make sure that you treat them well. Sometimes you will find that customers can be a bit difficult, it is these times when you must keep cool and speak with them calmly. Listen to their issues, express genuine concern, and then do your best to rectify the situation. If you earn a reputation of someone who yells at his customers – even if this happens only once – then you will find that it can quickly ruin your business. No one wants to go to a pizza place where there is the possibility that someone could start yelling!